This ceramic tile boldly proclaims an encouraging message, with relevant Bible verses underneath. Includes an easel stand on the back for upright display. 11.4 x 11.4cm. 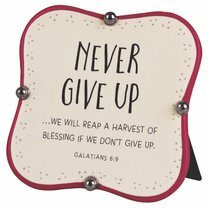 About "Ceramic Plaque: Never Give Up, Red/Cream Little Blessings (Gal 6:9)"